Aida is the result of the union of my two Syrian imports. I had dreamt of mating Basma with Khattaf, but was hesitant as they are from the same area and I was uncertain as to how genetically diverse such a combination would be. When Hannes Lohi's diversity test became available and I could use the results to verify the genetic diversity of the union, the Qashani K-litter was realized. The pups' birth was dramatic. Basma presented us with the first four pups without difficulty, but then things ground to a hault. Despite strong contractions the fifth pup did not emerge. Naturally this was in the middle of the night, as emergencies tend to be, and it took a while to get hold of the veterinarian who was on call. The vet performed an emergency C-section, which immediately revealed the cause of the troubles: the fifth pup had gotten into the birth canal doubled over and had consequently gotten stuck. It and the next two pups had died before we managed to get them out, but the last one, a tiny cream girl, was still alive. As I looked at the determinedly squirming puppy through streaming tears, I was reminded by a little girl from my childhood - a small and delicately built but infinitely spunky lass named Ida-Liisa, who pronounced her Rs as Ds. I once came upon her in the forest when she was about 5 years old - she was digging a hole with great gusto, the shovel about the same height as she was. When I asked her what she was up to, she wiped sweat from her brow and said proudly: "I'm digging a moosetrap!!" This plucky daughter of Khattaf and Basma was exactly like that: the sweet Ida-Liisa, a gutsy moosehunter at heart. Ida-Liisa, as I called her then, stayed with me until she was about 6 months old, as she was initially meant to go to a breeder in the USA. 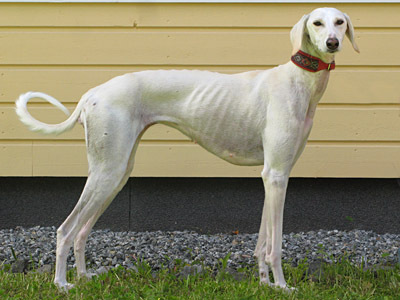 However, when her permanent teeth grew in she had a slightly undershot bite, so she stayed in Finland and first moved to Helsinki to a home with another Saluki. Due to the first owner's changed circumstances she came back to me in January 2010. Her owner had remarked on her exceptionally wonderful temperament and I could immediately see that she was right. 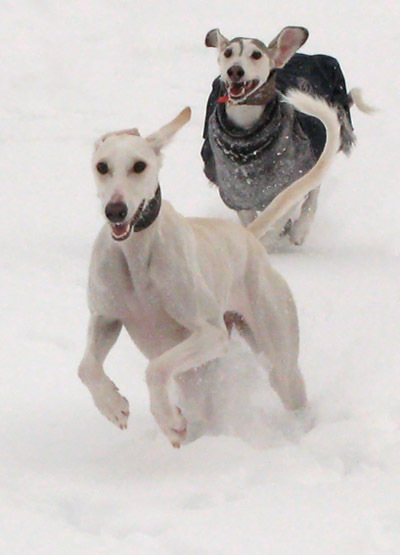 Aida waltzed into my pack of 9 Salukis as though she had never left, said her enthusiastic hellos and proceeded to race happily around my yard with the others. Then she came inside, climbed onto my lap, and fell asleep with a satisfied sigh. And so she continued. Her bite had improved so that she only had two lower incisors at a slightly wonky angle, so I began thinking about placing her on breeding terms, as the thought of excluding a dog from breeding because of two slightly angled teeth - a dog with such a magnificent temperament, breathtaking running style, gorgeous conformation and rare pedigree - seemed like a colossal waste (assuming she will stay healthy of course). Hyde and Sanja came to visit and like me they were immediately taken in by this lovely girl. 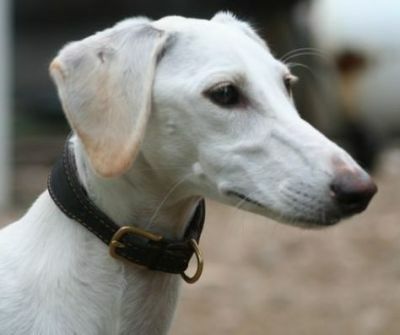 As Norppa - another Saluki from my breeding, who lives in Hyde's childhood home - needed a Saluki friend of her own and Aida in turn was in need of a good and cooperative home, Mirja and Lumikki drove here to meet her. She immediately climbed up into Lumikki's lap and that was that - Aida moved in with Norppa and her family in Kiuruvesi. Time will tell what the future has in store for us, but we hope for the best, and Aida appears to have settled in well!